Fairies Game Review - Download and Play Free Version! Release the helpless captive fairies! Beautiful sound accompanies this catchy match 3 fantasy-themed puzzler! Fairies is a fun, fantasy match 3 game where you release colored fairies trapped in bottles by making groups of 3. What makes Fairies really stand out is the astounding sound effects in the game. Fantasy music envelopes you as you work to free the fairies and make combo matches. Complete 100 mesmerizing levels and collect pieces of mystical images as you pass the levels in Adventure mode. Immerse yourself for hours as you travel across five increasingly challenging landscapes. Fairies lets you stop and restart playing or try any of the four game modes at will - perfect for playing on short breaks. 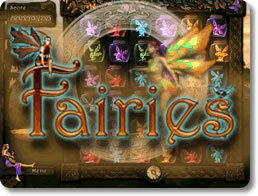 Fairies features personalized player profiles and automatic game saving. Clear a level over a quick break or dive in for hours of fun! 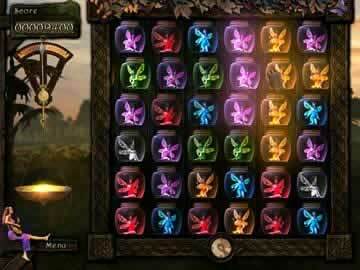 Fairies is a fun-filled match 3 puzzle game, similar in play to Chuzzle, that brings something for everyone. The game is simple enough to learn and play, but still provides an array of challenges. Four different modes of gameplay add to the complexity and fun. Colorful fairies are trapped in jars, and it's your job to free them by making matches. Not only is the gameplay well done, but the graphics and audio are excellent as well. Extremely addictive gameplay will get you hooked and keep you playing. 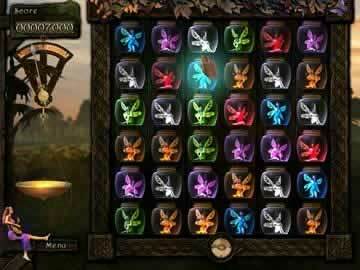 In Fairies, you have a grid that is full of jars with different colored fairies. Your objective in each level is to form groups of three or more of like-colored fairies. As you match the Fairies, you'll move closer to completing the level. Once you've made enough matches, you advance to the next level. It sounds simple enough, but the way the jars move can make it very challenging. Rather than switching or swapping fairies (like you do in other match-three games), you move entire rows or columns of fairies at a time. These rows and columns even wrap around the grid, so that dragging a column upward will make a fairy on the top of the grid appear at the bottom. On top of that, you'll need to deal with things like locked jars that prevent you from moving an entire row and column of fairies. You'll also be racing against the clock in some modes, adding even more pressure. There are four different modes of play available in the game. Adventure mode has you playing through a ton of levels as you race to make matches before you run out of time. Classic mode has you playing through various levels, but has no time limit. Relaxed mode is similar to Classic mode, except that you play endlessly on a single level. The fourth mode is Playback, which is similar to the game Simon. The grid has several groups of colored fairies. A pattern will play (ie red, blue, red), and you'll need to match the pattern by clicking the groups in the right order. It starts off fairly simple, but quickly ramps up as the pattern gets longer and longer. Fairies does not offer any different difficulty settings to choose from. However, the four different modes do offer something for players of all skill levels. Adventure mode and Playback are both fairly challenging and fast-paced. Classic and Relaxed mode allow less skilled or experienced players to play and be successful. The controls are few in number and simple in use, much like other match 3 puzzle games. You use your mouse cursor to click and drag the fairies in rows and columns. That's all you need to play the game. One great feature of the game is the presentation. The graphics are sharp, colorful, and packed full of special effects and flashes that make it even better. The music and sound effects are well done, and are enjoyable to listen to without being distracting or annoying. Despite the various modes you can choose from, there isn't a lot of variety in the play. You'll always be moving the rows or columns of fairies regardless of the other slight differences (except in Playback). While this can be a bit repetitive or boring, the game is also very addictive at the same time. The Playback mode gives you something that helps change up play and fight the repetitive feel. Fairies is an excellent game choice for players who absolutely love match 3 puzzle games, as well as players who have never touched them before. Simple gameplay and controls make it an easy game to learn and enjoy. A variety of modes provide the the perfect experience for players of all skill levels. A thrilling presentation adds some personality and makes the game fun for all ages. Fairies is an addicting and entertaining game that won't disappoint.